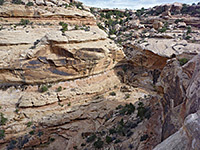 Slickhorn Canyon drains the southwest side of Cedar Mesa, eventually meeting the San Juan River within Glen Canyon NRA. 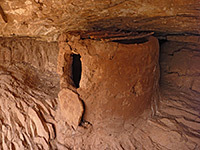 The upper part splits into four forks, all containing Anasazi ruins and pictographs, and all relatively simple to view, since they are either at or close to the canyon floor, or above not too steep slopes. The dry washes leading to the four branches are accessible by (unpaved) road, just a mile or so apart, hence hikes can either be down and back the same fork, or down one and up another; each is around 3 miles long and has an easy-to-follow trail running through, cairned where necessary. The access road is in good condition, regularly maintained like most others in the area, and each trailhead has a BLM information notice, map and register. Although a little further from the highway than some trailheads (between 4.4 and 8.3 miles), the canyon system is still quite popular, and a typical spring weekend may see a dozen groups exploring the ruins. Walking is generally straightforward as most parts are not too overgrown, despite flowing water in several places; these clear streams are useful if camping, though the canyon is not a major backpacking destination since it is relatively short, and ruins are found only in the upper forks, not the longer, deeper section further downstream. 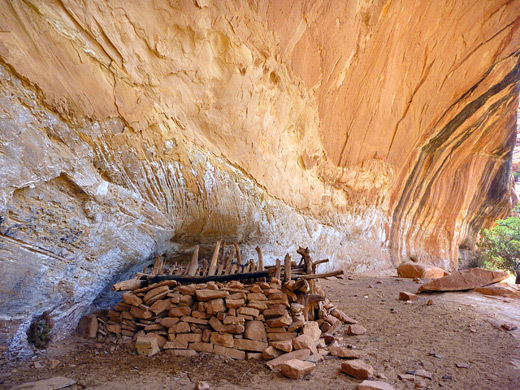 The first (northernmost) fork of Slickhorn Canyon contains the most ruins, some small, and including the most famous site in the area, Perfect Kiva. The second fork has only a couple of granaries, while the third and fourth both each have one good site towards the lower end. The hike described below is down the first fork, past the second and up the third to its ruins, returning the same way - a round trip of 9.5 miles, taking about 5 hours. Map of Cedar Mesa, Grand Gulch and Comb Ridge. 21 views of Slickhorn Canyon; gallery, slideshow. The unsigned track to Slickhorn Canyon forks west off UT 261 between mileposts 19 and 20 opposite Cigarette Springs Road (to Lime and Road canyons), which is signposted. A fee station is passed after half a mile; like all canyons hereabouts, $2 is charged for day use (or $5 for up to 7 days), and $8 if camping, in which case a free permit is necessary, obtained from the Kane Gulch ranger station. After 2.5 miles a track branches off on the right towards the Government Trail, used to enter lower Grand Gulch, then after 4.3 miles another, unsigned track leaves to the west, soon reaching the parking area and trailhead for the first fork of Slickhorn Canyon. This track is narrower, and uneven towards the end, so may not be suitable for all vehicles, in which case parking can be along the main route, though space is very limited owing to absence of verges. The next three trailheads are right along the road, after 5.6, 7.0 and 8.3 miles, and all have enough space for camping. The unmaintained trail at the head of the first fork starts off down a shallow creekbed, often containing pools and regularly visited by cattle. The drainage remains shallow for just over half a mile, the floor mostly slickrock, before deepening slightly after a minor tributary joins from the south then slowly descending further over the next mile. The first ruin is a granary, well hidden above the streambed, inside a bend, shortly before a big dryfall as another branch joins from the north. This is passed by walking along a bench on the south side, round an outside bend then an inside bend, until the path begins a steep, cairned descent, opposite a detached pinnacle on the far side; it drops down nearly 300 feet back to the streambed, which is now full of boulders and more overgrown. 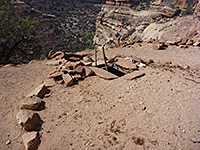 Perfect Kiva ruins are located high in an alcove below the north rim of Slickhorn Canyon, round the first corner after the trail descends back to the streambed. A neat granary on the right side of the settlement is the only part visible from below as the rest is well hidden, but a spur trail forks off the main route, showing the way. 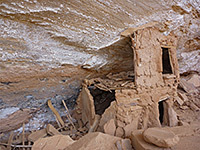 The dwelling was built at the base of the thickest vertical component of the brownish Cedar Mesa sandstone walls, about 100 feet up. 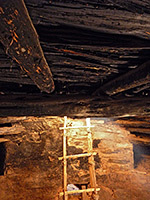 The kiva is the most spectacular part of the site, complete with intact, undamaged roof and a replacement ladder providing a means of entry; the original was removed in the 1980s to a nearby museum. Close by are several rooms, one blackened by soot and also retaining its original timbers, plus the well preserved granary that is visible from below. 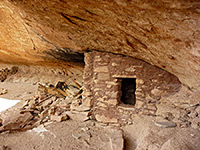 As with all major ruins on Cedar Mesa, information about the history of the site is provided by the BLM, via a pamphlet placed in a metal box, together with a visitor register. Further downstream, after some easy, level walking, are a few more ancient remains, including some wall remnants far above the streamway on a precarious ledge, and another, circular granary in a small alcove, not too high. This is just after the junction with the second fork of the canyon. The third fork joins round the next bend, and its lower reaches hold a permanent stream, flowing across slickrock and forming clear, shallow pools. More flat walking, either along a path or over the level rocks leads to an overgrown area around a spring, beside a ground-level alcove on the north side, in which are found a photogenic group of ruins. The most unusual structure is a split-level granary, built with thin, stick-reinforced walls and equipped with two entrances. This adjoins a collapsed room, while on the far side stands a long and stone kiva, its roof mostly complete. 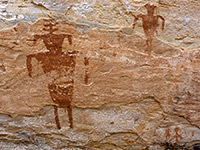 A black area on one part of the cliffs indicates the location of a fireplace, bordered on the left by solid red pictographs and on the right by much fainter, outline pictographs, presumably older. This is the only major site in the third fork of Slickhorn Canyon, and from here the first fork trailhead is 4.8 miles away if continuing upstream then north along the road, or 4.7 miles if retracing steps back up the first fork.